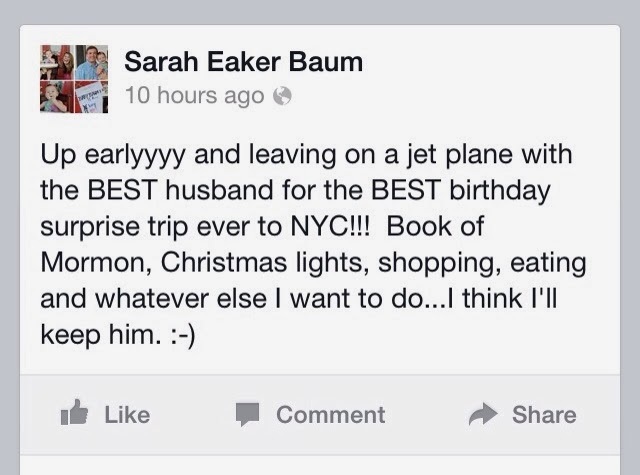 Baum Squad: The Baum Family Blog: I'm in a New York state of mind. I'm in a New York state of mind. Hurray!!!!! I was so excited and surprised that I cried. We left this morning and are here until Tuesday, my birthday. Best surprise ever? I think so. I'll be back on Wednesday with fun updates about our trip and how much Lills hated Santa this year. And the giveaway! Don't forget to enter, you only have until Tuesday at midnight! Happy birthday week to me! I'm thinking year 30 will be the best yet. 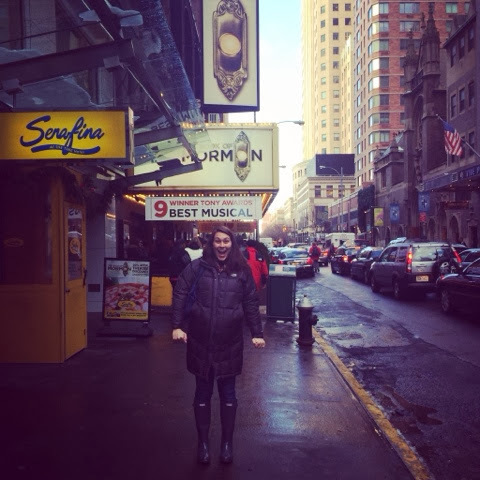 Book of Mormon was AMAZING. My mother would have hated it, but if you can take the sacreligious parts with good humor it's incredible. My husband and I both thought it was absolutely hysterical and so well-done, I can see why it's getting so many awards. He had to call in a favor for the tickets and I am so grateful!